Wanted on several planets of the Consortium of Civilized Worlds for unethical practices in the medical profession, Ross Douglass (a human name that he began using after dodging his last trial) is an unassuming, likable fellow who is quick to come to the aid of others in an emergency and even quicker to exploit their gratitude after his heroism is established. Ross has made a living from using his considerable psychic powers to manipulate people into believing that he is the only one in the universe capable of healing their illnesses. My days in paradise are over, and now it is back to America for more working, more gaming, and more blogging. I mentioned before I left that I was going to put some major time into the blog when I returned, and those plans have not changed. In fact, my first Rifts post in quite some time will follow this post shortly. It has been good to get my hands on some Rifts material again... makes me want to play! In any case, I just wanted to announce my return! Thanks for reading! I wouldn't say that I post regularly, but I do manage at least one post a week... usually two. For those following, I'm about to disappear for a bit. I'll be on vacation in Panama, and there will be no gaming or blogging for the next few weeks. Outsyder Gaming will be up and running again in July! A new banner that incorporates more than just my Warhammer 40K obsession. I really like the banner as is, but it isn't really representative of the eclecticism of this blog. I'd like to get D&D, Rifts, and Magic: The Gathering in there somehow... I'm just not sure exactly how I'm going to accomplish that feat. More Rifts material. 90% of my visitors who find me through search engines are looking for Rifts material, so I want to support them. I love the Rifts Megaverse... and even if I'm not actually playing in it at the moment, there's no reason I can't come up with some content for it. I actually have quite a few Rifts-related posts saved as drafts that I just never got around to finishing for some reason or another... they'll be the first to appear. A major store update... Yeah, I know I just announced one a few weeks ago. But this time I'm going to make the jump and actually create an eBay store. eCrater, while I appreciate that it is free, just doesn't have the options that I want... and having run an eBay store in the past, I keep wanting to go back. The last few posts of my Lessons from Randy Maxwell series. I hate that I haven't been as consistent in my writing as I intended. A revisiting of several other "series" that I started but never finished. So come back to visit in a few weeks! I think you'll like what you see! Junk, a collective name for green-black-white "good stuff" decks in Legacy, just happens to be fairly easy for me to build, since I have most of the essential cards already. The most expensive additions I'll need to make are the dual lands, but those hold (or increase) their value over time better than anything other than the power nine, so they aren't a bad investment. For now, I can continue using the Ravnica block shock-lands. They do the exact same thing... they just cost you a few life when you're playing them aggressively. This teaser video hit YouTube last week, and yeah... it looks really cool. I would be playing standard, but I don't have enough cards for a good deck or enough money to build one... and I'm not willing to trade good legacy cards for things that will be relatively useless in a year. But alas, I'm only playing drafts and fun games for the moment (except when I get to borrow a deck). I've had the luxury of drafting three times in the last three months, and two out of three of those have been pretty successful. This report describes the most recent, on June 3rd. A few weeks ago, I made a grand proclamation that I plan to build a cheap 40K army without using Games Workshop miniatures. I mentioned wanting to use cheaper alternatives but needing to figure out where to find them. Since then, it has been pointed out to me that Mantic Games has announced that they will branch into sci-fi. I can't believe I've gone months without hearing about this... and these leaked pics have surfaced recently as well. In any case, I believe this could be the start of a beautiful relationship between Mantic and me... I'm certainly looking forward to this Warpath series. An interesting idea hit me a week or so ago, and it has kept coming to mind over and over again since. 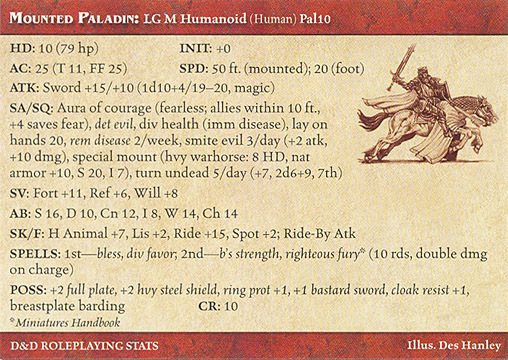 While sorting through various sets of cards in my game room, I stumbled upon the cards for my D&D Miniatures and started reading through some of them again. 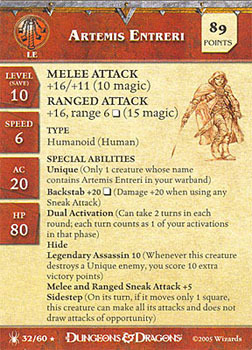 The idea is brilliant... stats for a skirmish wargame on one side of the card and roleplaying stats on the other! But what if that wasn't necessary?